This page will walk through Spring session, Redis and Servlet integration example. By default a java web application uses servlet container to save session values. Spring session can externalize the persistence of session attributes values. We can use external source to save and fetch session ids. Here in our example we are using Redis. Session id will be stored as keys in Redis. Spring session replaces the HttpSession implementation by a custom implementation. To perform this task spring session creates a SessionRepositoryFilter bean named as springSessionRepositoryFilter. Spring Session with Redis works as follows. 1. Spring session exposes a SessionRepositoryFilter bean named as springSessionRepositoryFilter. 2. The bean springSessionRepositoryFilter is responsible to replace Servlet container HttpSession implementation by custom implementation such as Redis. 3. To use HttpSession backed by Redis using JavaConfig, Spring session provides @EnableRedisHttpSession annotation that will be annotated at java configuration class. @EnableRedisHttpSession exposes SessionRepositoryFilter bean named as springSessionRepositoryFilter . 4. To use HttpSession backed by Redis using XML configuration, Spring session provides RedisHttpSessionConfiguration class. We need to create a bean of this class in our spring application context XML file. RedisHttpSessionConfiguration exposes SessionRepositoryFilter bean named as springSessionRepositoryFilter . 5.To get connection with Redis, we need to create a bean of RedisConnectionFactory implementation. If we are using Lettuce then create the bean of LettuceConnectionFactory class in both cases JavaConfig as well as XML configuration. 6.When we run java servlet application and save values in session then it will not be saved in Tomcat Servlet container. Now the session values will be saved in Redis. Spring session creates a cookie with name SESSION instead of JSESSIONID in the browser. 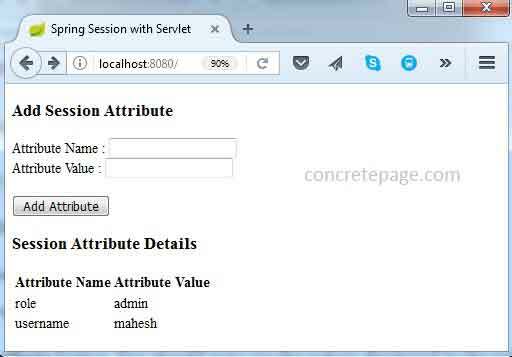 Here we will provide complete example of spring session with servlet using Redis. 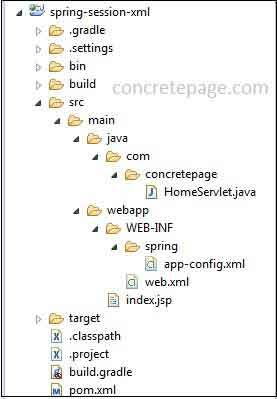 We will use JavaConfig as well as XML configuration in our demo. To work with Spring Session using Redis, we need to install Redis in our system. Find the below steps to install Redis. 1. Go to the link and download the Redis. If operating system is Windows then visit the link. Minimum required version of Redis for Spring Session is redis-2.8. 2. Extract the archive file and go to the location as below. 3. Click on redis-server.exe to start the Redis server. Server will be started with default port 6379. 4. To run Redis command, click on the redis-cli.exe file. A command prompt will open and we can run the Redis command. For Redis command details visit the link. 5. Find some Redis commands. 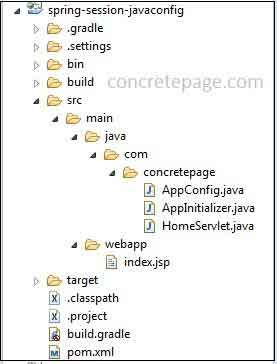 Find the project structure in Eclipse with JavaConfig. We will create sample Servlet and JSP file for spring session demo. We are doing a simple task here. In JSP, user will enter session attribute name and value and submit the form. Servlet will access those values and call setAttribute() of HttpSession. But values are not being persisted in Tomcat Servlet container. Session values are being persisted in Redis. 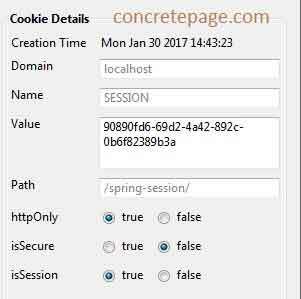 Spring session creates a cookie named as SESSION in browser that contains the id of our session. Lettuce is an advanced Redis client that is used for thread safe synchronous, asynchronous and reactive usage. It supports Cluster, Sentinel, Pipelining, and codecs. Lettuce allows sharing one connection by multiple threads if they avoid blocking. LettuceConnectionFactory : It is a connection factory that creates Lettuce based connections. We get LettuceConnection instance for every call of getConnection() method of LettuceConnectionFactory class. Multiple LettuceConnection instances share a single thread safe native connection by default. This shared native connection is never closed by the LettuceConnection instance and hence while calling getConnection() method, connection is not validated by default. If required we can change this behavior by using setValidateConnection(true) method of LettuceConnectionFactory while instantiating it. @EnableRedisHttpSession: This annotation is added to configuration class. Using this annotation, it automatically adds @Configuration to the configuration class. It exposes a bean of SessionRepositoryFilter with bean name springSessionRepositoryFilter that will be backed by Redis. We have also to provide RedisConnectionFactory implementation bean. In our example we are using Lettuce based connection, so we have created a bean of LettuceConnectionFactory class. To load our application configuration AppConfig class, find the application initializer class. AbstractHttpSessionApplicationInitializer is the implementation of spring WebApplicationInitializer interface. It performs following task. 1. It registers DelegatingFilterProxy to use springSessionRepositoryFilter before any other registered Filter . 2. It also registers spring ContextLoaderListener . 3. It ensures that our servlet will use springSessionRepositoryFilter for every request that is responsible for replacing HttpSession implementation by custom implementation backed by Redis. Find the project structure in Eclipse with XML configuration. Find spring application context XML file to configure spring session. 1. RedisHttpSessionConfiguration exposes a bean of SessionRepositoryFilter with bean name springSessionRepositoryFilter backed by Redis. SessionRepositoryFilter implements Filter and replaces the HttpSession implementation to be backed by Spring Session. 2. We should use <context:annotation-config/> because Spring Session does not provide Spring XML Namespace configuration right now. Get more information from the link . 3. Create a bean of LettuceConnectionFactory that implements RedisConnectionFactory. The role of RedisConnectionFactory is connecting Spring Session to Redis Server on default port 6379 . 1. To configure spring application context XML file i.e app-config.xml in our example, we need to configure contextConfigLocation using <context-param>. Configure ContextLoaderListener that will read contextConfigLocation and will pick up our app-config.xml file. 2. In app-config.xml file we have configured RedisHttpSessionConfiguration that exposes a bean of SessionRepositoryFilter with bean name springSessionRepositoryFilter backed by Redis, responsible for replacing the HttpSession implementation to be backed by Spring Session. Now we need to ensure that Servlet Container uses our springSessionRepositoryFilter for every request. So we need to configure springSessionRepositoryFilter mapping. 3. Spring DelegatingFilterProxy will look up a bean with the name springSessionRepositoryFilter that casts a filter backed by Spring Session. Hence for every request that invokes DelegatingFilterProxy will invoke springSessionRepositoryFilter. To run the project, follow below steps. 1. Download the source code using download link given below on this page. 2. Using command prompt, go to the root directory of the project and run following command. For Gradle, use below command. We will get WAR file inside build\libs directory. For Maven, use below command. We will get WAR file inside target directory. Now deploy WAR file in tomcat and access the URL as follows. Add some session attribute names and values. Find the print screen. If we check values in Redis, we will get our session id. Find the print screen. Now if we check browser cookie for localhost domain, we will get a cookie named as SESSION and this cookie will keep same session id as stored in Redis. If we delete the session id from Redis, then we will observe that sessions attributes values will also be deleted from the application session. I am done now. Happy Spring Session Learning!